Both of these books address issues we never heard about during the presidential campaign. If we are to repair our political discourse in the face of segmented news sources and fake news conspiracies, we need to be more attentive to these institutional forces. If we want our candidates to speak to the real issues that would make government work for people (and thereby refute the claim that “government can’t do anything”), we need to listen more. So I was pleased to be able to dive into Arlie Hochschild’s excellent book on Tea Party folks in Louisiana. A Berkeley sociologist, Hochschild took her qualitative lenses to the part of the country that confronts remarkable paradoxes. Inequality has grown substantially in spite of the new job economy that has gone along with expansion in the oil industry and fracking startups. Government oversight of those industries is usually seen as unwanted intrusion at best and harm causing at worst (the Obama administration’s moratorium on oil exploration after the explosion of Deep Water Horizon is an example of the latter.) But there is an awareness that the rules are written in favor of those oil concerns so government wasn’t going to do anything anyway (but somehow regulations could still apply to individual citizens who violated environmental guidelines). 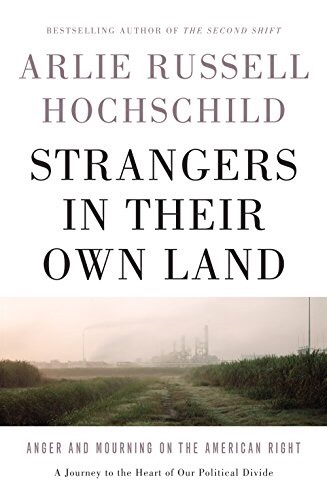 Hochschild rejects the simplistic approach that asks why these Louisiana voters were acting against their economic self-interest. She begins her book refuting the argument made 12 years ago by Thomas Frank in What’s the Matter With Kansas. Frank had argued that Republicans offered social issues (Roe v. Wade, prayer in schools) to voters that they never moved on while supporting economic policies that worked for big business. Rather than beginning with her thesis and then finding supportive anecdotes, Hochschild is committed to finding the Deep Story that is motivating decision making (including voting). One of the most compelling aspects of the book is that Arlie tells her story of discovery along the way. The reader gets to follow along as she makes discoveries and starts connecting dots. When she arrives at a tentative Deep Story, she then tries it out on the people she has gotten to know during her visits. She shares her own struggles in trying to reconcile life in former plantation Louisiana with her life back in Berkeley. The Deep Story she arrives at has an image of people standing in line for the American Dream. They have been standing for a long time, waiting to get their shot (Hamilton reference!). But society has been shifting demographically and attitudinally. People keep being invited into line in front of them and their promise of a good life is continually deferred. Moreover, the people put in line in front of them (immigrants, refugees, independent women, blacks, gays) are being helped by the social forces controlled by government. Nobody is looking out for their interests at all and the powers that be seem to be working directly counter to those interests. This image of line cutting is quire consistent with the argument Robert Jones made in The End of White Christian America. Not only is it true that American society is changing with regard to religion and demography (albeit slower in Louisiana than in the country as a whole), it also aligns with Jones’ argument that 2016 saw a rise in “nostalgia voters”: people who longed for an earlier time when the Big Story worked (simply calling them racists and homophobes is as limiting as Frank focusing on economic issues). The paradox is that this story fails to deal with the significant issues at their front door. Arlie uses environmental concerns as the keyhole issue through which one can read the relationship between the people, the free market, and the government. There is the story of Bayou d’Indie and how illegal dumping by the major employer destroyed the entire ecosystem making land unproductive and fishing absolutely hazardous. In 2012, careless drilling by Texas Brine punctured the Napoleonvillle Dome, a salt dome nearly 4000 feet below Bayou Corne. (Apparently, storing various materials in underwater salt domes is a common practice.) The result was a sinkhole that eventually subsumed 37 acres and inundated the water supply with flammable gas. The I-10 freeway bridge running across Lake Charles needs to be replaced because the clay on which the supports rest is contaminated with EDC (ethylene dichloride) which renders the supports unstable. But media sources don’t cover these stories (how did we miss news of a 37 acre sinkhole?). And the people tend to think that interfering with the free market would be ineffective. The companies have too many lawyers, give too many campaign contributions, and infiltrate the oversight bodies. It wouldn’t do any good and the jobs on which the people are dependent might simply go away. There is little tie between corporate culture and community culture (perhaps due to tax abatements offered to get the plants to explore the oil and gas deposits that go with the terrain). This passage helped me understand the concern about “political correctness” for the first time. The issue isn’t that they want to be free to use racial epithets or homophobic slurs or echoing Rush Limbaugh’s concerns about “femi-nazis”. It’s that they don’t want people to tell them how they are suppposed to feel. A commitment to being free to feel as you want rings true to me. I see it in the 81% of white evangelicals who supported Trump. I see it in Michael Wear’s conversation with Emma Green today on how democrats lost evangelicals. The challenge for us going forward is that there is a huge disconnect between the feeling concerns and the institutional forces that are really impinging on those feelings. If we stay at the emotional level, we feed a rugged individualism that insists on protecting one’s one interests. There is little there to build an understanding of the common good much less to build good policy. But a necessary first step is to actually linked to hearing the experience of others. That’s something that policy makers of both parties need to work on.